If you happen to be lucky enough to be anywhere near Toronto during the span of March 11th to 15th I would definitely recommend spending a little time to check out the Toronto Short Film Festival. Not only is it a great chance to see some sweet new Indie works from up and coming artists, there’s an entire block of shorts dedicated to nothing but horror, which I assume you’re passionate about. I was lucky enough to interview the Director of one of these shorts, Lena Burmenko, who actually also stars in her film “Exorcism.” Join us as we pick her brain about directing horror and to give you a taste of what’s to come. If this sounds like your cup of tea, details on the festival are directly below the interview. Using a “memory scan” is a fresh approach to telling the story of an exorcism. What made you decide to tell this story in particular? To answer this question I’m going to start with a bit of a general background of how this film came to be. I co-create the majority of my work with my boyfriend and creative partner, John Krissilas. We’re both actors and filmmakers and many of our friends and colleagues in the industry are familiar with the work we produce. Steve Kasan, who stars in and also wrote the script for Exorcism, approached us with an idea to make a 3 minute short for the My RØDE Reel 2018 Short Film Competition. He had an idea to make a film about an exorcism but from the POV of the possessed. We of course loved the idea and were completely on board. John, who starred, co-produced, and was the 1st AD, then had the idea to present it as a “memory scan” of the possessed. I absolutely loved this idea because it added a futuristic sci-fi element to the story and created a “true story” vibe to it like Olatunde Osunsanmi‘s The Fourth Kind does. You know that you’re watching a fictional film but you can’t help but feel a sort of realistic eeriness to it. Having it be a “memory scan” also serves as a quick establishing element for the 3 minute film. From the first few seconds of the film the audience is already aware of what they’re about to watch and why they’re being shown this. I have this idea that if a feature film was ever based on this concept, the 3 minute short could serve as one of the archival footage clips the characters are watching on a computer while looking through all the memory scans of various patients. 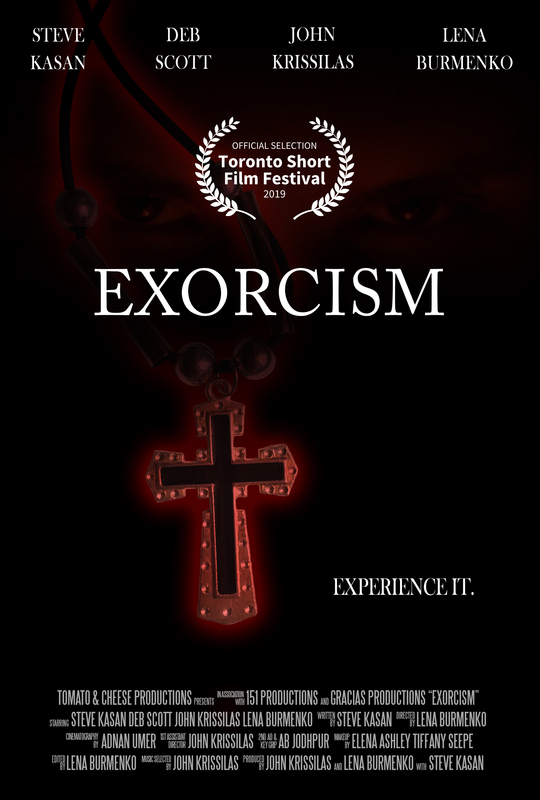 Fun fact: Exorcism was #3 Top Voted Film from Canada in the My RØDE Reel 2018 Short Film Competition. I’ve always found that found footage and other POV films are far more immersive in their horror. What made you decide to shoot this from the first person perspective? I definitely agree, and that’s why we chose to make the film entirely in POV. As I mentioned before, Steve already had the idea to do the film in POV when he approached John and I. He then wrote the script for it that became what you saw as Exorcism. We did at some point play around with the idea of maybe having some shots not be in first person perspective but then agreed against it because it would take away from the fully immersive experience that we were trying to create. We also chose to do the entire film in continuous takes. We had to do multiple rehearsals and shoot many takes to make sure everything was just right how we wanted it from start to finish both in the performances and cinematography. The actors Steve Kasan, John Krissilas, and Deb Scott did such a wonderful job being constantly in the moment, it really helped with the flow of the entire process. And of course our cinematographer Adnan Umer nailed it with his camera work. He was very patient being squished up on the bed next to me, having to smoothly nail his levitation, and contributed great ideas throughout the process. 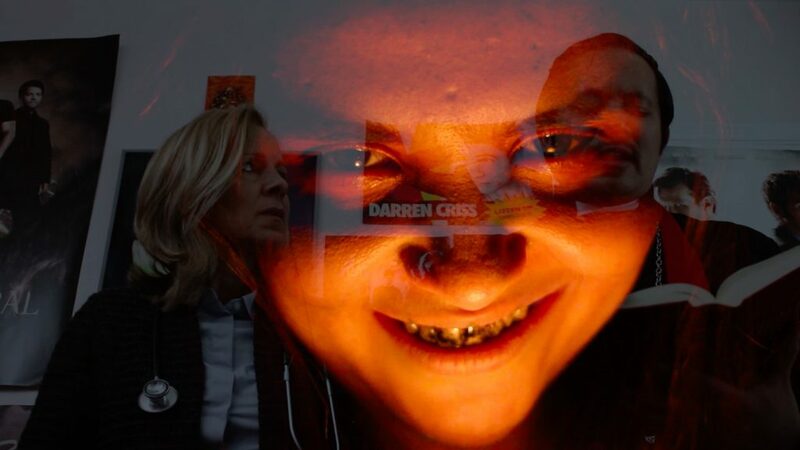 Also a shoutout to our fabulous makeup artist Elena Ashley Tiffany Seepe who created the demon face. I really enjoyed playing around in that makeup. The film wouldn’t have the same intensity without her wonderful work. I even scared John a couple of times just by looking at him when we were on our lunch break. That’s how good her makeup was. You’ve been both an actor and a director, puling double duty in this film. Which do you prefer and why? Both. It might sound like such a cop-out answer to not choose one but I really can’t. I love both acting and filmmaking in their own way. As an actor I get to portray the story through my performance. As a filmmaker I get to do the same but through directing, editing, producing, writing, cinematography, I’ve done it all at one point or another. As a director you are responsible for everyone on set so I would say there’s definitely a bit more stress involved sometimes versus coming to a set solely to act. However, I’ve found that even as an actor, especially on smaller indie productions, I sometimes get asked for creative input from the production perspective, which I thoroughly enjoy. I think that might be because a lot of people I work with know that I’m a filmmaker as well. It is nice though to show up on set solely as an actor, only having to focus on acting, but even then I’m always open to helping out creatively behind the scenes if asked. So I stick by my answer of both. As both are quite fulfilling creatively and an adventure in their own way with each new project. I am also a singer and get asked sometimes if I had to choose between working in only film and TV or the music industry for the rest of my life which would I choose? I always say all of them. Acting, filmmaking, and music have all been a part of my life for a really long time. My very first acting experience was playing a bunny back in grade one in my school’s play. I still have cassette tapes from old camcorders somewhere in my closet with footage for short films I used to make with my friends and family as a kid. My older sister, Vira Burmenko, is a musician who’s been playing since I was born so I’ve also been involved with music one way or another for as long as I can remember. All these things are a part of me and what make me the type of a creative individual that I am. If I imagine a world where I could do only one of these things I don’t think I would feel as creatively fulfilled as I do by doing all of them. I noticed a lot of familiar faces from around the Toronto indie film scene. Do you have a group of actors, writers and directors you prefer to work with? For starters, John Krissilas is absolutely my rock and filmmaking partner for life. We’re always on the same wavelength creatively and have each other’s back. He’s an actor and a filmmaker like myself and is always open to trying new things and he’s a creative problem solver when dealing with whatever obstacles come our way in any stages of production. Over the years I’ve also made a lot of friends in the industry whose work I know, trust and believe in. I’ve made strong connections with other creatives that I know I can rely on to deliver great work both in performance and filmmaking. So I would have to say yes there are people I prefer and love to work with, however, it’s a large group of individuals that is continuously expanding as I am always open to meeting and working with new creative individuals. This industry is all about networking and teamwork and I love working with people who share the same passion for making art and entertainment. Both John and I go to a weekly acting meetup called The Actors Place (TAP). It’s a weekly practice workshop for actors and many actors who attend it are also filmmakers. A lot of people we work with we have met through there. For Exorcism for example, our wonderful cinematographer Adnan Umer, Dr. Perreira played by the fantastic Deb Scott, and our lovely 2nd AD and key grip AB Jodhpur are all members of TAP. Our writer and lead actor playing Chris, Steve Kasan, and our talented makeup artist Elena Ashley Tiffany Seepe, are not from TAP but they are both individuals we have worked with prior to this project and it’s always a pleasure being on set with them. When you work with people that you have a mutual understanding with, people you just click with, you want to keep working with them because it’s always a great experience through all the ups and downs of filmmaking. Do you find it harder or easier to tell a story in a short film versus full length, and why? I find that it really depends on the story. Some stories are easier to tell in short length and vice versa. One of the benefits of short films is that we can create multiple shorts in the same amount of time that it would take to create a full length feature film. In some short films you are also able to focus on a specific moment in time without needing to go into a full length backstory of how we got to this point. Like in our film Exorcism, where we just focus on the moment of the exorcism itself. On the other hand, if you have a short film idea that’s more ambitious and better suited for a feature, here lies the challenge of how do you still tell this larger story in a short format but in a compelling way that makes your audience care about the characters. This can be a frustrating challenge but with a very rewarding outcome when you finally figure it out. In general, I think it’s good to constantly be challenged in filmmaking one way or another. Whether you’re making shorts or features unplanned things will come up and having to deal with those obstacles and challenges is what helps me to constantly improve as a filmmaker. I definitely came away with a sense of hopelessness after watching your film. If you wanted audiences to come away with a particular theme or moral from your film, what would you prefer it to be? I don’t like to specify too much of anything in particular that I would want people to come away with because I’d like for everyone to interpret it in their own way. I love seeing and hearing about people’s initial reactions to the film: they’ve been quite diverse. Looking forward to seeing how the audience at the Toronto Short Film Festival reacts to it on March 12. The screening at the Carlton Cinema will be the theatrical premiere of Exorcism. We also have a screening coming up at the Toronto Indie Horror Fest later this year. What kind of projects can we look forward to seeing you act and direct in for the future? John and I recently completed Marked Season 1 (6 Episodes), our award winning sci-fi mystery web series that we co-created and both star in. We actually made Exorcism in the midst of post-production for Marked. Marked Season 1 is making its web festival circuit right now and we are planning our next web series. We’ll either be making Marked Season 2 or taking a break from it for now and creating a whole new sci-fi series altogether. Though Marked is primarily classified as a sci-fi mystery thriller, it has some elements of horror in it. Season 1 is available to watch on YouTube and on our website www.MarkedWebSeries.com . Though I love making sci-fi and horror genre films, I’d love to one day also get to star in and have creative input behind the scenes of a feature film musical, combining my passion for acting, filmmaking and singing. Dakota Dahl has no idea what he is doing, but people seem fine with paying him to do it.